[Originally published in November 2006 as a PDF (click here, 1.5 Mb). In January 2006 I wrote a pamphlet entitled Nine Lies about Global Warming in which I sought to summarise for the lay reader the state of the debate about increasing atmospheric concentrations of carbon dioxide, and the widespread predictions of catastrophic global warming which would ensue as a consequence of man's use of fossil fuels. Despite the inherent scientific implausibility of these predictions, and the complete lack of empirical evidence to support them, a number of current political leaders and former leaders, notably UK Prime Minister Tony Blair, former US Vice President Al Gore and Australian Labor Leader Kim Beazley, have embraced these predictions. The Environmentalist movement throughout the West has united behind global warming as its primary campaign ambition, and the political power of the Environmentalist movement has generated very large expenditures as a consequence. The most bizarre manifestation of what Cardinal George Pell has described as 'pagan emptiness'  is the despoliation of coastlines and mountain ridges with thousands of wind turbines in the UK, in Germany, Denmark, and now increasingly in Australia. Most of the strong advocates of human-induced global warming appear to be too personally invested in global warming both from a scientific and a career perspective. They cannot (and will not) back away from their unrealistic warming ideas. It appears that only a new set of climate researchers who are not already committed to the warming straight-jacket will be able to render an objective assessment of human influence on climate. Despite the influence within government and the media which the science-politicians such as Lord May and James Hansen have in their respective domains, the weight and authority of real experts who are able to refer to real data is beginning to impinge upon the public debate. One consequence is the increasingly maniacal desperation of the anthropogenist school, who seek to impose censorship and even imprisonment of their critics. Those who have seen Al Gore's film An Inconvenient Truth, and who are acquainted with American history, will have recognised the religious tradition of millenarian preaching to which it conforms. The end of the world is nigh! Judgment Day is at hand! Repent you of your sins and resolve to lead a better life! Missing from the Gore version is God's participation in these climactic events. Nature has taken God's place, but otherwise the script is unchanged. Man's sin is responsible for the coming catastrophe, and unless we repent of our sins and give up our use of fossil fuels, then catastrophe will surely bring the world to an end. The upper classes of the West have much more influence in international forums such as the UN than in the democratically elected parliaments and congresses which still carry primary responsibility for national decision-making in the West. This upper-class influence is brought to bear directly through selection of elites to the civil service and indirectly through NGOs such as the World Wildlife Fund (WWF), Greenpeace, and business organisations such as the World Business Council for Sustainable Development (WBCSD). These NGOs have strong connections to the various UN agencies such as UNEP (United Nations Environment Programme) and their influence was manifest in the Rio Earth Summit and UN Framework Convention on Climate Change of 1992, which in turn led, in December 1997, to the Kyoto Protocol. The essential element of the Kyoto Protocol was that those industrialised nations which ratified the Protocol committed themselves to specified reductions in CO2 emissions by 2012. The base year of 1990 was chosen and each industrialised country was given a specified target to reach. Australia's target was 108 per cent of 1990 emissions. Countries which did not achieve their targets were to be penalised in the years following 2012 and a supra-national inspectorate, headquartered in Bonn, was to be established to police the global decarbonisation programme. Australia and the US, however, have refused to ratify the Protocol and in January 2006 another international organisation was formed, the Asia Pacific Partnership on Clean Development and Climate, known as AP6, which included China, Japan, Korea, India, Australia and the US. Its aim is to respond to climate change issues through technological progress and adaptation. It was bitterly attacked by the Environmentalists as an attempt to subvert the Kyoto Protocol. At the end of 2006 it is clear that by 2012 only two of the ratifying nations which committed to carbon dioxide emission reductions, the UK and Sweden, will fulfil the promises they made in 1997. But more importantly, India and China, two nations which are industrialising at historically unprecedented growth rates, and which are seen as emerging world powers, have made it clear that they will increase energy production without restraint to meet the demands of a modern economy, and will use coal and other fossil fuels, together with nuclear energy, as required. There is now no prospect at all of an internationally accepted global regime of decarbonisation, and although the EU is considering the imposition of tariffs on goods from countries such as China which have not embraced CO2 emission reduction policies, such policies, if implemented, will merely encourage further economic stagnation within Europe. The scientific debate over carbon dioxide and climate change has seen some important developments since January 2006, and the anthropogenists are, as far as the science goes, in retreat. Of particular importance is the growing understanding of the saturation effect. Implicit in the climate models used by the anthropogenists as the foundation of their claims of warming catastrophe is the rapidly diminishing impact of carbon dioxide on the radiation balance at the edge of the stratosphere. On their own assumptions a doubling of atmospheric CO2 will yield only an 0.8°C change in global temperature. Politically, however, they are moving forward, using the current drought in Australia as a vehicle for their campaign. In October 2006, the Howard Government announced subsidies worth $125 million for a solar power station in northwest Victoria and a subsidy of $30 million for the Hazelwood Power Station in the Victorian Latrobe Valley. The nine important facts about climate change which are discussed in this pamphlet show that this expenditure is a complete waste of taxpayers' money. Fact 1. Climate change is a constant. 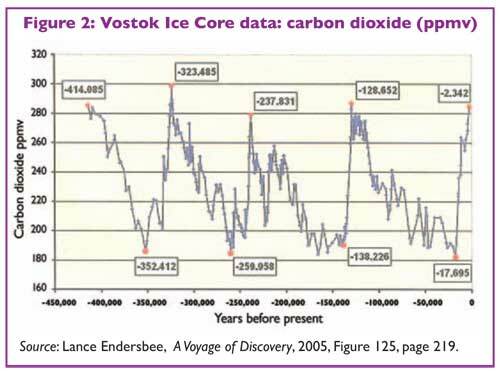 The Vostok Ice Cores show five brief interglacial periods from 415,000 years ago to the present. The Greenland Ice Cores reveal a Minoan Warm Period 1450-1300 BC, a Roman Warm Period 250-0 BC, the Mediaeval Warm Period 800-1100AD, the Little Ice Age and the late 20th Century Warm Period 1900-2010 AD. Fact 2. Carbon dioxide is necessary for all life on earth and increasing atmospheric concentrations are beneficial to plant growth, particularly in arid conditions. Because the radiation properties of carbon dioxide in the atmosphere are already saturated, increasing atmospheric concentrations beyond current levels will have no discernible effect on global temperatures. Fact 3. The twentieth century was almost as warm as the centuries of the Mediaeval Warm Period, an era of great achievement in European civilisation. The recent warm period, 1976-2000, appears to have come to an end and astro-physicists who study sunspot behaviour predict that the next 25-50 years could be a cool period similar to the Dalton Minimum of the 1790s-1820s. Fact 4. The evidence linking anthropogenic (man-made) carbon dioxide emissions and current warming is limited to a correlation which holds only for the period 1976 to 2000. Attempts to construct an holistic theory in which atmospheric carbon dioxide controls the radiation balance of the earth, and thus determines average global temperatures, have failed. Fact 5. The anthropogenists claim that the overwhelming majority of scientists are agreed on the anthropogenic carbon dioxide theory of climate control; that the science is settled and the debate is over; and that scientific sceptics are in the pay of the fossil fuel industries and their arguments are thus fatally compromised. These claims are an expression of hope, not of reality. Fact 6. Anthropogenists such as former US Vice President Al Gore blame anthropogenic emissions of CO2 for high temperatures, droughts, melting polar ice caps, rising sea levels and retreating glaciers, and a decline in the polar bear population. They also blame anthropogenic CO2 for blizzards, unseasonable snow, freezing weather generally and for hurricanes, cyclones and other extreme weather events. There is no evidence at all to justify these assertions. Fact 7. Increasing atmospheric concentrations of carbon dioxide will have negligible impact on the earth's radiation balance and will promote plant growth everywhere. There is no need to sequester CO2 in the ground or to subsidise nuclear or other non-carbon based methods of energy production. Fact 8. 'Tropical' diseases such as malaria and dengue fever are not related to temperature but to poverty, lack of sanitation and the absence of mosquito control practices. Fact 9. The decarbonisation of the world's economy would, if attempted, cause huge economic dislocation. Any democratic government which seriously sought to fulfil decarbonisation commitments would lose office. Shutting down coal-fired power stations and replacing them with renewable energy sources such as windmills or solar panels will cause unemployment and economic deprivation. 1. Climate change is a constant. 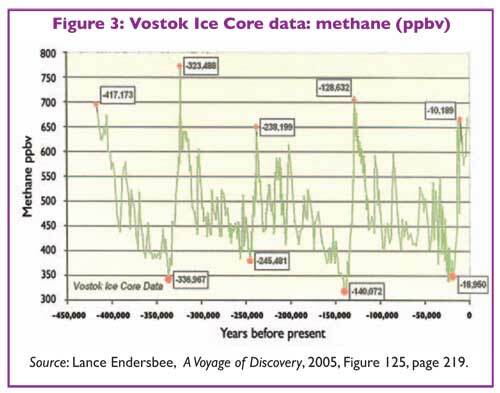 The Vostok Ice Cores show five brief interglacial periods from 415,000 years ago to the present. The Greenland Ice Cores reveal a Minoan Warm Period 1450-1300 BC, a Roman Warm Period 250-0 BC, the Mediaeval Warm Period 800-1100AD, the Little Ice Age and the late 20th Century Warm Period 1900-2010 AD. We are currently enjoying the warmth of an inter-glacial period which began about 19,000 years ago when the ice sheets covering the sub-polar regions of North America and Northwest Europe began to melt. Sea levels rose by 130 m (400 ft) separating Tasmania and Papua New Guinea from the Australian mainland over the next 8,000 years. Measurements of isotopic concentrations found within gas bubbles contained within the ice recovered from the Vostok Ice Core, and also from isotopes recovered from ocean sediments, reveal that over the last 500,000 years the earth has experienced mostly Ice Age conditions with average temperatures between 10 and 12 degrees lower than we now enjoy. 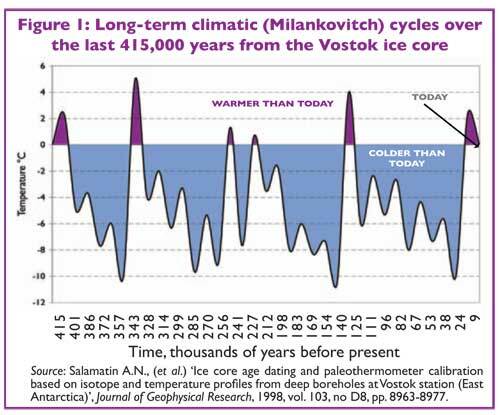 Within this secular icy environment, the earth has periodically enjoyed a brief period, typically 10,000 years or so, of warm weather, known as interglacials, The temperature record from the Vostok Ice Cores is shown in Figure 1. The temperature record correlates extremely well (albeit with a time lag) with CO2 and methane concentrations in the atmosphere. There are two schools of thought with competing theories which seek to explain this history. Those who follow Milankovitch argue that periodic changes in the earth's position and inclination relative to the Sun provide sufficient cause for the glacial and interglacial cycle. Others argue that these manifestations of huge energy changes in the state of the earth can only arise from perturbations in the state of the Sun and the other giant planets of the solar system, Jupiter and Saturn particularly, and the impact which these perturbations have on the earth. Lance Endersbee states 'I suspect that the explanation of this phenomenon of such large variations and regular behaviour may be due to geotectonic activity induced by orbital variations'. It is noteworthy that temperature changes pre-date changes in CO2 and methane concentration changes by at least 400 years. At each interglacial, when the land ice covering much of North America and northwestern Europe melted, and sea levels rose about 130 metres (as occurred most recently between 19,000 and 11,000 years ago), global temperatures rose to a level that was slightly warmer than current temperatures. Despite the significant natural increase in carbon dioxide and other greenhouse gas concentrations during the warming periods, there has been a recurring upper bound to earth's temperature over the past million years. Earth reached that upper bound about 8,000 years ago and the long-term projection is for a cooling trend. Past fluctuations of climate provide a benchmark against which to assess the Intergovernmental Panel on Climate Change (IPCC's) high-end projections of global warming. The IPCC's computer projections grossly violate earth's historical experience. That the relatively minor increase in the magnitude of radiative forcing from doubling carbon dioxide concentration could produce such amplification in the global temperature response as the computer models (GCMs) predict, is not credible. 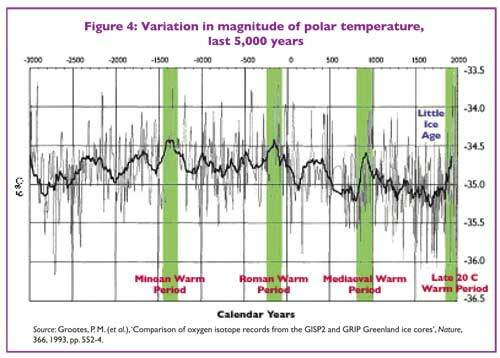 The Greenland Ice Cores provide a temperature record for the last 5,000 years (see Figure 4). Clearly manifest are the Minoan, Roman, Mediaeval and contemporary Late Twentieth Century Warm Periods. The Little Ice Age, usually dated from about 1350 to 1850, is also easily discerned. Anthropogenic carbon dioxide cannot provide an explanation for this temperature history, particularly for the Mediaeval Warm Period. The most fruitful area of research seems to be in the field of astro-physics where sunspot activity provides good correlations with temperatures. 2. Carbon dioxide is necessary for all life on earth and increasing atmospheric concentrations are beneficial to plant growth, particularly in arid conditions. Because the radiation properties of carbon dioxide in the atmosphere are already saturated, increasing atmospheric concentrations beyond current levels will have no discernible effect on global temperatures. Carbon dioxide (CO2) is a colourless, odourless, tasteless, non-toxic gas which is essential to all life on earth. (Carbon monoxide, however, is extremely toxic and will cause death very quickly if inhaled.) All green vegetation requires carbon dioxide as plant food and the process of photosynthesis, in which plants take in carbon dioxide, absorb solar radiation, store the carbon and emit oxygen, is basic to life. 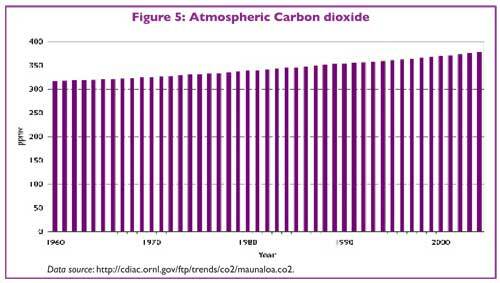 As concentrations of carbon dioxide increase, the rate of growth of plants also increase. Flowers and vegetables grown in hothouses are frequently fed with extra carbon dioxide for faster growth and higher yields. As atmospheric concentrations of carbon dioxide have increased from approximately 325 ppmv (parts per million by volume) in 1970 to 375 ppmv today, wheat yields in Australia have increased in the last 30 years, in part because of CO2 enrichment. Coal-fired power stations which have modern flue-gas scrubbing equipment built into their exhaust systems will have smoke-stack emissions which are barely visible. Carbon dioxide cycles naturally through the atmosphere, the earth's land mass, and the oceans. Huge volumes of carbon dioxide are injected into the oceans and atmosphere during earthquakes and volcanoes. The amount of carbon contained in atmospheric carbon dioxide is about 730,000 million tonnes (730 Gigatonnes of carbon (GtC)). The annual transport of carbon to and from the land surface and the atmosphere, is estimated at 120 GtC; between the oceans and the atmosphere the estimate is 90 GtC. The annual emissions of carbon dioxide to the atmosphere resulting from human activities is, by comparison, about 7 GtC, or less than 1 per cent of the total atmospheric carbon mass, and less than 4 per cent of the natural annual emissions from the biosphere and the oceans. Changes in the natural transport of carbon, as well as human activities, have led to recent increases in atmospheric concentrations of carbon dioxide. The measurements taken at Mauna Loa in Hawaii are shown in Figure 5. The most important characteristic of carbon dioxide's impact on the radiation balance of the earth---the so-called greenhouse effect---is that as atmospheric concentrations of CO2 increase, the impact on the earth's radiation balance caused by the resonance of the CO2 molecule at wavelengths of 15 microns diminishes rapidly. As the graphs shown in Figures 6 and 7 show, once CO2 concentrations exceed 200 ppmv, further increases have diminishing impact on the radiation balance, and doubling present concentrations from 375 to 750 ppmv will have only marginal impact on that balance. Such an increase would have a marvellously beneficial effect on plant growth everywhere and, according to eminent hurricane scientist William Gray, will also lead to an increase in rainfall of about 3 per cent. The IPCC's radiation balance model of climate assumes that at the upper boundary of the stratosphere, radiation from the sun is matched by radiation from earth to space. Given the Sun's net input of 235 watts per square metre, if there were no greenhouse gases, the earth would radiate energy into space at 235 watts per square metre and the average global temperature would be -15°C. Greenhouse gases, predominantly water vapour, reduce the net radiation loss and stabilize the average global temperature at approximately +15°C. However, unlike other greenhouse gases, radiation to space from the active radiation bands of carbon dioxide is originating in the stratosphere where the earth's temperature is about -50°C. 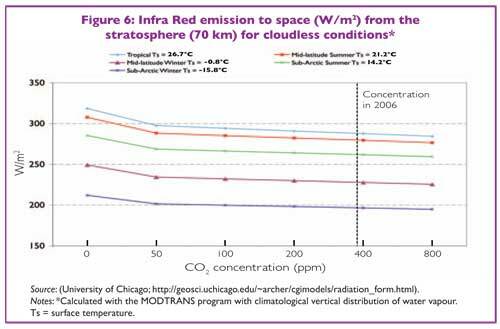 Adding more carbon dioxide through anthropogenic emissions does not significantly alter the radiation to space because the temperature of the stratosphere varies little with altitude. The radiation to space is governed by the temperature of the emitting molecules and the projected doubling of CO2 concentrations to 760 ppmv, on the IPCC's own hypothesis and using the IPCC's data, further reduce IR radiation to space by less than a trivial 4 watt per square metre which generates, using the IPCC's model, an average global temperature increase of 0.8°C. 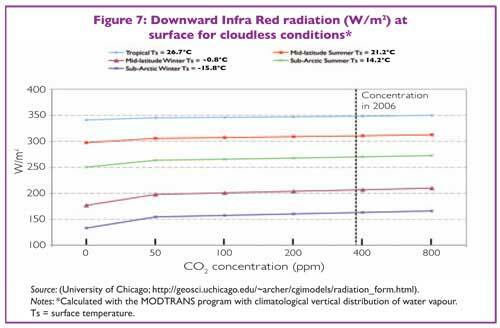 The IPCC's radiation balance model of climate is seriously flawed. There is no energy balance at the top of the stratosphere; but the point remains that on the assumptions which underpin the climate models on which the IPCC relies, a doubling of atmospheric CO2 will have minimal impact on global temperatures. The saturation effect is something which should be fully understood by the IPCC, but it is completely ignored by the anthropogenists. 3. The twentieth century was almost as warm as the centuries of the Mediaeval Warm Period, an era of great achievement in European civilisation. The recent warm period, 1976-2000, appears to have come to an end and astro-physicists who study sunspot behaviour predict that the next 25-50 years could be a cool period similar to the Dalton Minimum of the 1790s-1820s. Despite the bitter cold of the 1940s and 1950s, it is evident that the twentieth century was comparable to, although probably not as warm as, the benign centuries of the Mediaeval Warm Period. The IPCC was established in 1988 under the auspices of the UNEP (United Nations Environment Panel), and the World Meteorological Organisation (WMO). Its brief was to provide an authoritative international statement of scientific opinion on climate change and it produced the temperature curve shown in Figure 8 in its first report of 1990. It has issued two such reports since. The most recent, the Third Assessment Report (TAR), was released in Shanghai in January 2001. The authority of the IPCC has been used by many governments (including the Australian Government) as justification for various perceived decarbonisation policies such as the subsidies now given to the owner-operators of wind farms and solar power stations, proposed carbon taxes of one kind or another, and various carbon trading schemes which are merely add-ons to carbon taxes. Most recently the Switkowski Inquiry into nuclear energy in Australia was established on the underlying basis that nuclear energy is 'carbon free'. At the IPCC press conference at which this Third Assessment Report was launched, a backdrop showing a graph of northern hemisphere temperatures from 1000 to 2000 AD was prominently displayed. 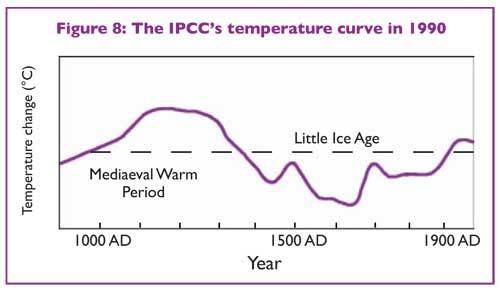 This graph, Figure 9, which became known as 'Mann's Hockey Stick', was so widely used by the IPCC that it became a de facto corporate logo. From 1000 to 1900 AD the northern hemisphere temperature was depicted as slowly cooling by 0.2°C. From 1900 to 2000 AD the temperature took off in a straight line showing a century of warming of 0.6°C. 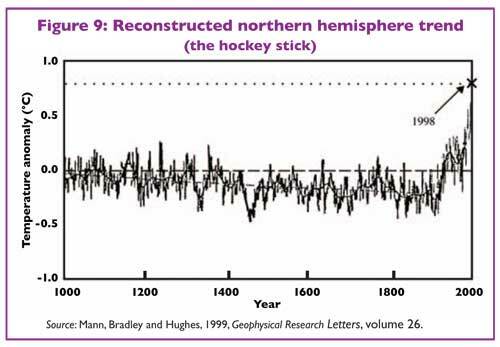 The graph looked like an ice hockey stick, with the handle running from 1000 to 1900 AD and the blade shooting upwards from 1900 to 2000 AD. The lead author of the research which led to this graph was Michael E Mann, now of Penn State University. The purpose of the graph was to legitimise the claim that twentieth-century warming is unprecedented; that it is due to anthropogenic emissions of carbon dioxide; and that the increase in twentieth-century temperatures has been so precipitate that drastic policies of decarbonisation have to be implemented. In particular, the well-known history of the Mediaeval Warm Period, 800 AD to 1300 AD, an era which was warm enough for Vikings to establish a colony in Greenland which lasted for at least 500 years, was to be airbrushed out of the historical record. Also deleted from the record was the Little Ice Age which ran from about 1350 AD to about 1850 AD. From the mid-nineteenth century, temperatures began to rise intermittently and we can refer to 1900 AD as the start of the Modern Warm Period. In addition to debunking the hockey stick, Mr. Wegman goes a step further in his report, attempting to answer why Mr. Mann's mistakes were not exposed by his fellow climatologists. Instead, it fell to two outsiders, Messrs. McIntyre and McKitrick, to uncover the errors. Mr. Wegman brings to bear a technique called social-network analysis to examine the community of climate researchers. His conclusion is that the coterie of most frequently published climatologists is so insular and close-knit that no effective independent review of the work of Mr. Mann is likely. 'As analysed in our social network', Mr. Wegman writes, 'there is a tightly knit group of individuals who passionately believe in their thesis'. He continues: 'However, our perception is that this group has a self-reinforcing feedback mechanism and, moreover, the work has been sufficiently politicized that they can hardly reassess their public positions without losing credibility'. In other words, climate research often more closely resembles a mutual-admiration society than a competitive and open-minded search for scientific knowledge. And Mr. Wegman's social-network graphs suggest that Mr. Mann himself---and his hockey stick---is at the centre of that network. Thus it has been established at the highest levels of statistical scholarship that the algorithm which the authors used to process tree-ring data from bristle-cone pines in North America not only produced the hockey stick published and promoted by the IPCC, but was able to produce a hockey stick from a series of random numbers. The IPCC has not retracted its egregious error. It carries on as if nothing is wrong with its conduct or its conclusions. If the IPCC were a commercial corporation operating in Australia, its directors would now be facing criminal charges and the prospect of going to jail. There is now a great deal of evidence to show that the Mediaeval Warm Period was a global phenomenon. It was during this period that Europeans enjoyed agricultural prosperity with an abundance of food and population growth. They made huge progress in technology, inventing, for example, mechanical clocks and windmills, building the great cathedrals, and establishing cities such as Venice, Florence, Milan, Genoa, Amsterdam, and eventually London, which became great banking and trading cities which laid the foundations of Western growth and development. It is ironic that the anthropogenists should seek to erase from the record this remarkable era of human progress as part of their campaign to return Western society to a state of extreme energy deprivation. The only temperature maximum from the 1990s is from WA. 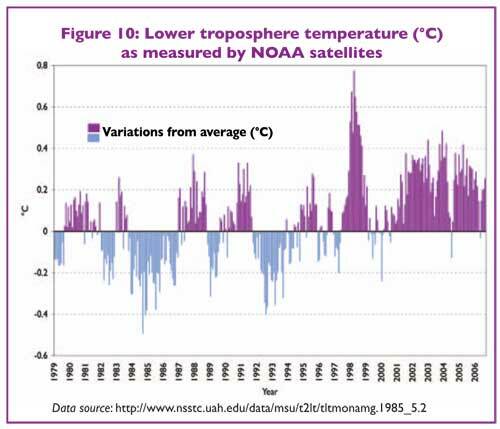 The temperature record based on satellite measurements which began in 1979 is shown in Figure 10. It shows that 1998 was the hottest year since 1979 and that temperatures have declined since. The period 1790-1820 was particularly cold in Europe and is known as the Dalton Minimum. It can be discerned in Figure 4 and it is associated with Sunspots 5 and 6 which were very weak solar cycles. Sunspots 24 and 25, which will begin to exert their influence on the solar winds and magnetic fields emanating from the Sun within the next two years, are predicted to be similar to Sunspots 5 and 6 in weakness. If these predictions turn out to be accurate, then the current global warming catastrophism will doubtless rapidly change into global cooling catastrophism. 4. The evidence linking anthropogenic (man-made) carbon dioxide emissions and current warming is limited to a correlation which holds only for the period 1976 to 2000. Attempts to construct an holistic theory in which atmospheric carbon dioxide controls the radiation balance of the earth, and thus determines average global temperatures, have failed. If we plot global temperatures and atmospheric CO2 concentrations for the period 1970-2000 we will obtain a reasonably good correlation, and it appears plausible to argue that anthropogenic emissions are causing global warming. 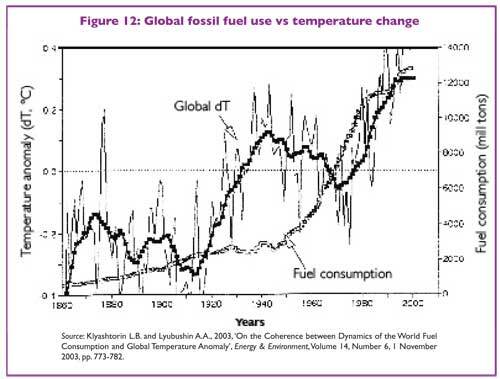 A good correlation, however, does not prove causality between the two variables, and even more importantly, if we extend our time scale and plot fossil fuel consumption (a good proxy for anthropogenic emissions) against temperature change from 1860 to 2000, we see no correlation at all. Here we see that global temperatures rose from 1860 to 1875, then cooled until 1890, rose until 1903, fell until 1918 and then rose dramatically until 1941-42. We then experienced the long cooling until 1976, the year of the Pacific Decadal Oscillation, and since then temperatures have risen by about 0.4°C. There is essentially zero correlation between the temperature curve and the anthropogenic CO2 curve over this 140-year period. This fact alone should have brought the carbon dioxide-induced global warming debate to an end. It is also becoming clear that the huge computer models upon which the anthropogenists base their predictions bear little relationship to what actually happens in the complex world of the atmosphere and the oceans which interact to produce our climate in all its variability. These models also fail to take into account changes in solar eruptions which are manifest in variations in sunspot activity, and which correlate extremely well with the historical record of low global temperatures, such as the Dalton Minimum of 1790-1820 , the Maunder Minimum of 1660-1690, and the Sporer Minimum of 1450. Astro-physicists are predicting that the next sun spot cycles, No. 24 and No. 25, will be of low intensity and will therefore result in high cloud cover and low temperatures. NASA has predicted that No. 25 will be the quietest sun-spot cycle for hundreds of years. Within 20 years we will know the winner in this scientific contest. 5. The anthropogenists claim that the overwhelming majority of scientists are agreed on the anthropogenic carbon dioxide theory of climate control; that the science is settled and the debate is over; and that scientific sceptics are in the pay of the fossil fuel industries and their arguments are thus fatally compromised. These claims are an expression of hope, not of reality. The progress of science since the Middle Ages has not been made through consensus and censorship but through individuals who have challenged existing orthodoxies and shown them to be either wrong or inadequate. Galileo and his challenge to the Jesuits is a well known example. It is a revealing commentary on the global warming debate that the anthropogenists place so much weight on their claimed monopoly of scientific opinion. A number of prominent scientists claim that anthropogenic CO2 emissions have already caused global warming and must be severely curtailed to prevent future climate catastrophe. However, their predictions are tainted by their patronage arrangements with governments or political leaders who have invested heavily in global warming catastrophism. When political leaders identify themselves with a scientific theory, they can often exert great pressures to ensure that critics are squeezed out of research grants and career opportunities. These tactics do not compare with Stalin's treatment of critics of Lysenko and his theories of the inheritability of acquired characteristics and other bizarre notions. The consequences for many Russian geneticists who opposed Lysenko were fatal. But the conjunction of political prestige and scientific authority does explain why so many scientists, dependent on the grace and favour of politicians, are very careful in what they say about carbon dioxide and global warming. A brief history of how the CSIRO became trapped in anthropogenist dogma is relevant here. The years 1987 through 1992 were critically important for the evolution of Australian Federal and State policies on greenhouse. The leading, and for public purposes the only, source of scientific input, rarely disputed, was the Division of Atmospheric Research of CSIRO. CSIRO and the Commission for the Future held the Greenhouse '87 Conference from 30 November to 4 December 1987. Attended by about 260 people, the Conference and its book Greenhouse: Planning for climate change set a benchmark with a 'working scenario' of 'predicted' climate changes of rising sea levels and temperatures over the following 50 years. The year 1988 was critical because the international conference The Changing Atmosphere: Implications for Global Security was held in Toronto from June 27 to June 30 1988. The Conference Statement called for 'Actions by Governments and Industry' which included the Toronto Target: 'Reduce carbon dioxide emissions by approximately 20 per cent of 1988 levels by the year 2005 as an initial global goal'. The Toronto Target rapidly became accepted wisdom amongst the chattering classes globally, and was embraced and promoted by CSIRO. It was therefore assumed to have a valid, scientific basis. Adopted by the Federal Cabinet in October 1990, it also became a benchmark set by many State governments. The Federal Coalition, then led by John Hewson, advocated an even more rigorous target. The policies of both Government and Opposition in 1990 put much greater impositions on Australia than the 1997 Kyoto target. In his 50-page monograph in 1990, Postponing Greenhouse, Brian O'Brien vigorously attacked the Toronto Target as being 'merely a number plucked from the 1988 entrails at Toronto'. The proceedings of the Toronto Conference show that the number evolved as a two-part 'challenge' from a half-day workshop, with no scientific credibility or basis. But the CSIRO still attacked O'Brien's claim, both in briefing Ministers Simon Crean and Ros Kelly and in the June 1991 Bulletin of the Business Council of Australia. The May Bulletin published part of O'Brien's 21 March 1991 submission to the Industry Commission Inquiry into Greenhouse Gas Emissions. The June Bulletin published the CSIRO response commissioned by the Industry Commission and O'Brien's rebuttal to CSIRO. This was the first time there had been any serious open public debate in Australia about greenhouse science. The CSIRO finally admitted that the Toronto Target was set politically, but continued to defend it. It remained the pivot of the first National Greenhouse Response Strategy of 7 December 1992, the 'No Regrets Policy' which prevailed in Australian Governments until Kyoto in 1997. The scientific basis of the National Strategy was not published until two weeks after the COAG Heads of State endorsed the Strategy. However, those climate change forecasts had been gazumped one month previously, in November 1992, when CSIRO itself issued new forecasts drastically smaller than its 1987 climate-change impacts. The CSIRO had down-scaled the greenhouse effects, but governments stayed locked into early, more frightening predictions. CSIRO did not publicise the old and the new forecasts side by side. The only opposition to the CSIRO's position of monopoly advice at this time came from complete outsiders such as John Daly and former professor of space science, Dr Brian O'Brien. The climate orthodoxy perpetuates the misconceptions involved by speaking, as IPCC does, about the Scientific Basis of Climate Change. Since then, I have responded to that ideology by stating that there is no chance at all that the physical sciences can produce a universally accepted scientific basis for policy measures concerning climate change. Each of the successive summaries [to the IPCC's Assessment Reports] has been phrased in such a way as to appear a little more certain than the last that greenhouse warming is a potential disaster for mankind. The increasing verbal certainty does not derive from any particular advance of the science. Rather, it is a function of how strongly a statement about global warming can be put without inviting a significant backlash from the general scientific community. Over the years, the opinion of that community has been manipulated into more-or-less passive support by a deliberate campaign to isolate---and indeed to denigrate---the scientific sceptics outside the central activity of the IPCC. The audience has been actively conditioned into being receptive. It has thereby become gradually easier to sell the proposition of greenhouse disaster. Professor Paltridge has publicly discussed the threats, made by the CSIRO, of funding cuts to the Antarctic Research programme for which he was responsible, after he had made sceptical comments in the press about the global warming 'consensus'. 6. Anthropogenists such as former US Vice President Al Gore blame anthropogenic emissions of CO2 for high temperatures, droughts, melting polar ice caps, rising sea levels and retreating glaciers, and a decline in the polar bear population. They also blame anthropogenic CO2 for blizzards, unseasonable snow, freezing weather generally and for hurricanes, cyclones and other extreme weather events. There is no evidence at all to justify these assertions. As the years passed and North America, the UK and Northern Europe experienced some rather severe winters (but not as severe as the winter of 1946-47) the global warming story began to look a bit threadbare. So the words 'climate change' superseded 'global warming', and explanations were put forward as to why increasing anthropogenic emissions of carbon dioxide could lead to severe winters as well as hot summers. The high point of this campaign was the movie The Day After Tomorrow which showed New York inundated with snow and ice as global warming triggered the onset of the next Ice Age. The only way to produce an ocean circulation without the Gulf Stream is either to turn off the wind system, or stop the earth's rotation, or both. planet Goofy, a strange lost world where it's perfectly normal for apparently sane people to walk around protesting about global warming in sub-zero temperatures. Or, as the Canadian Press reported: 'Montreal---tens of thousands of people ignored frigid temperatures Saturday to lead a worldwide day of protest against global warming'. Unfortunately, no one had supplied an updated weather forecast to the fellow who writes the protesters' chants. So, to the accompaniment of the obligatory pseudo-ethnic drummers, the shivering eco-warriors sang: 'It's hot in here! There's too much carbon in the atmosphere!' Is this the first sign of the New Ice Age the media warned us about last week? But the point is, as Steven Guilbeault of Greenpeace puts it: 'Global warming can mean colder, it can mean drier, it can mean wetter, that's what we're dealing with.' Got that? If it's hot, that's a sign of global warming, and, if it's cold, that's a sign of global warming. During the northern summer of 2005, Florida, Louisiana and Texas bore the brunt of some severe cyclones. Katrina, in particular, caused enormous damage in New Orleans. Once again the anthropogenists were quick to blame it all on global warming and carbon dioxide emissions. Swiss Re and Munich Re are two very large re-insurance companies which have been doing all they can to support the argument that anthropogenic carbon dioxide is the culprit. There is no evidence at all to support this. There is zero correlation between the incidence and severity of cyclones with atmospheric concentrations of CO2. Insurance payouts, of course, have increased greatly. This is because Americans have been migrating to the warmer southeastern states. Florida now has a population of 20 million and the value of real estate in that State has increased accordingly. We are told that the polar ice caps are melting; that polar bears are endangered; that glaciers are retreating; and that sea levels are rising and threatening the populations of the so-called 'low-lying island states'. Before the AP6 meeting in Sydney on 11-12 January 2006 (the Asia Pacific Partnership on Clean Development and Climate), a serious public relations exercise was conducted by representatives of the low-lying Pacific Island States. The claim made by the Alliance of Small Island States (AOSIS) is that because of global warming, sea levels are rising, their islands are being submerged, and in this particular instance the demand made of the Australian Government was that the citizens of these states should be given permanent residency visas in Australia. The problem here again is that there is no evidence to support their claims. The South Pacific Sea Level and Climate Monitoring Project, funded by AusAID and managed by the National Tidal Facility (NTF), has found that sea levels are rising, at best, by 5 millimetres per annum. Professor Nils Axel-Morner, head of the Paleogeophysics and Geodynamics Department at Stockholm University, and past president of the INQUA Commission on Sea Level Changes and Coastal Evolution, has debunked rising sea level claims. His arguments are supported by satellite measurements which show no change in sea level over the past decade. Morner and his team did an exhaustive investigation of the claim made by the IPCC that the Maldive Islands in the Indian Ocean are at risk from sea level rise accelerated by global warming. He found considerable evidence that the sea level in the Maldives has fallen over the past 30 years, and that the islands and their people survived much higher sea levels in the past. What is rarely mentioned is that many of these islands are near the boundaries of the earth's crustal plates, whose movement is responsible for their uplift or sinking relative to global mean sea level. The global warmers' argument for rising sea levels is that the polar ice caps are melting and therefore sea levels are rising. It is revealing that many anthropogenists do not understand that the Arctic Ice Cap, floating as it does in the Arctic Sea, makes no difference whether it is in solid or in liquid form. The solid form---ice---has a density 90 per cent of the liquid form, which is why it floats---just---in water. Whenever rising sea level stories are given a run on TV, we have shots of Antarctic icebergs calving from the ice shelf. We do not, however, see snow falling onto the Antarctic ice sheets some thousands of metres above sea level where temperatures are rarely above freezing point. Satellite observations tell us that the Greenland ice sheets are thickening, not diminishing, and that the Antarctic Ice sheet is now believed also to be thickening, not diminishing. 7. Increasing atmospheric concentrations of carbon dioxide will have negligible impact on the earth's radiation balance and will promote plant growth everywhere. There is no need to sequester CO2 in the ground or to subsidise nuclear or other non-carbon based methods of energy production. The claim that increasing concentrations of atmospheric CO2 will cause runaway rising temperatures is at the heart of the global warming scam. It is based on projections coming out of climate models run on the most powerful computers which purport to simulate the behaviour of the atmosphere as it responds to changes in carbon dioxide concentrations. The claim that computer models can do this and produce meaningful results is regarded as nonsense by the leading scientists in the fields of fluid mechanics, numerical modelling of complex systems, and climate science. the task of finding all nonlinear feedback mechanisms in the microstructure of the radiation balance probably is at least as daunting as the task of finding the proverbial needle in the haystack. The blind adherence to the harebrained idea that climate models can generate 'realistic' simulations of climate is the principal reason why I remain a climate skeptic. From my background in turbulence I look forward with grim anticipation to the day that climate models will run with a horizontal resolution of less than a kilometre. The horrible predictability problems of turbulent flows then will descend on climate science with a vengeance. A model is nothing more than a formal statement about how the modeller believes the part of the world of his concern actually works it may be years before computer capacity and human knowledge are adequate for reasonable simulation the main models in use all have similar errors, but it is hardly surprising, for they are all essentially clones of each other. The apparent ability of the computer models to simulate the global surface temperatures of the 20th century comes with too many assumptions and shortcomings. Despite the IPCC advocacy, it is not possible to isolate anthropogenic greenhouse gases as the cause (or even a major cause) for the observed warming of the last two and a half decades of the 20th century. The world-wide advance of mountain glaciers until the mid-19th century, and their steady retreat since, point toward large-scale natural processes systematically affecting the climate system over prolonged intervals Whether the systematic processes are internal to the climate system, an outcome of external forcing, or a combination of these, cannot be determined with any confidence from existing data and analysis tools. As a corollary, the sensitivity of the earth's temperature response to greenhouse gas forcing cannot be scaled by reference to the magnitude of recent global temperature increase and the forcing by anthropogenic greenhouse gases as represented in computer model simulations of the 20th century. Skilful initial-value GCM climate prediction will likely never to be possible. This is due to the overly complex nature of the atmosphere/ocean/land system and the inability of numerical models to realistically represent the full range of physical complexity and to integrate this complexity forward for hundreds of thousands of time steps into the future. Realistic initial-value forecasts currently cannot be made more than a week or two into the future. Any imperfect representations of the highly non-linear parameters of the atmosphere-ocean system tend to quickly degrade (the so-called butterfly effect) into unrealistic flow states upon long-period integration. Skilful short-range prediction is possible because there tends to be conservatism in the initial momentum fields which can be extrapolated or advected for short periods. But beyond about 1-2 weeks, the many multiple unknown and non-linear energy-moisture exchanges within the earth system become dominant. If skilful GCM climate forecasts were possible, we would be eager to track their skill. Currently, GCMs do not make seasonal or yearly forecasts. They dare not issue these forecasts because they know they are not skilful. GCM climate forecasts cannot compete with empirical climate forecast schemes. How can we trust GCM climate forecasts 50 and 100 years into the future (that cannot be verified in our lifetime) when these same models are not able to demonstrate shorter range forecast skill of a season or a year? This crucial point has to be emphasized. Predictions of catastrophic temperature rises are based on computer simulations, mathematical models, of the behaviour of the atmosphere and oceans which cannot represent the extraordinary and still not fully understood complexity of the real world. To impose huge economic and social dislocation on the basis of such predictions would be the triumph of fear and superstition over reason. 8. 'Tropical' diseases such as malaria and dengue fever are not related to temperature but to poverty, lack of sanitation and the absence of mosquito control practices. The IPCC claimed in 1995 that increasing global temperatures, consequent to increasing CO2 concentrations, would lead to the spread of malaria and other mosquito-borne diseases. At that time it was pointed out, amongst other things, that Oliver Cromwell had died of malaria in London in September 1658 at a particularly cold period in English history. Paul Reiter, formerly Chief of the Entomology Section, Dengue Branch, at the US Centre for Disease Control and Prevention in San Juan, Puerto Rico and now at the Pasteur Institute in Paris has written extensively on malaria in England and Northern Europe during the seventeenth century. His discussion of 'the ague' as it is described in Shakespeare and other contemporary documents, gives a fascinating insight into the perils of living in swampy areas such as Westminster and the coastal marshes of the Thames estuary. The scientific literature on mosquito-borne diseases is voluminous, yet the text references in the chapter were restricted to a handful of articles, many of them relatively obscure, and nearly all suggesting an increase in prevalence of disease in a warmer climate. The paucity of information was hardly surprising: not one of the lead authors had ever written a research paper on the subject! Moreover, two of the authors, both physicians, had spent their entire career as environmental activists. [One of these has published 'professional' articles as an 'expert' on 32 different subjects, ranging from mercury poisoning to land mines, globalization to allergies and West Nile virus to AIDS]. Among the contributing authors there was one entomologist, plus a person who had written an obscure article on dengue and El Niño, but whose principal interest was the effectiveness of motor cycle crash helmets (plus one paper on the health effects of cell phones). Reiter has pointed out that malaria and other 'tropical' diseases have more to do with living conditions than temperature. For example he has analysed the Texas-Mexico border, where dengue fever was prevalent in Mexico and rare in Texas despite the similar environmental conditions. The only difference was living conditions. Malaria is making a comeback in Africa, in central Asia, and other parts of the world suffering from political upheaval. The IPCC's attempt to link this to global warming is farcical, but it is a farce with serious consequences. Global warming is the mother of environmental scares. In the scope of its consequences for life on planet Earth and the immense size of its remedies, global warming dwarfs all the environmental and safety scares of our time put together. Warming (and warming alone), through its primary antidote of withdrawing carbon from production and consumption, is capable of realizing the environmentalist's dream of an egalitarian society based on rejection of economic growth in favour of a smaller population's eating lower on the food chain, consuming a lot less, and sharing a much lower level of resources much more equally. Abandoning coal-based electricity in Australia would result in the serious contraction or even demise of most of our export industries---viz., mining, metals processing, agriculture and food processing---which are highly energy intensive and thus benefit from low-cost electricity. The numbers are important. Coal-based power in Australia costs about $30-$40 per Megawatt hour (MWhr). Nuclear power, the only practical alternative to coal, currently costs $70-$80 per MWhr. Windmills, which generate electricity when the wind is blowing at the right speed, cost about $80-$130 per MWhr, but require backup from reliable sources which makes them completely uneconomic. They are currently being built on pristine coastlines and mountain ranges because of the substantial subsidies which electricity consumers provide to the operators of these behemoths. The burning of fuels such as bagasse, straw and sawdust to generate electricity is commercially attractive when the fuel is essentially a waste product (for example, bagasse), with a negative value. This happens without the need for legislation or subsidies. There have been a number of attempts to generate electricity using solar radiation. The CSIRO built a large, albeit experimental, solar power unit at White Cliffs in NSW. It was an economic failure. A private company built a large solar generating unit in the Mojave Desert in California using hundreds of parabolic mirrors. It went bankrupt. Solar power costs upwards of $200 per MWhr and is available only when the sun is shining. A number of economists have climbed onto the global warming bandwagon in order to promote so-called market mechanisms to reduce carbon emissions. Emissions trading is a popular proposal. All of these schemes are variants on the market for taxi-cab licences. Every major city in Australia has a regime of taxi licensing in which the number of taxis allowed to operate is limited by State regulation. This creates a scarcity factor which increases the value of the taxi licence, and these licences are traded for sums in the order of $250,000. If the regulation requiring taxi drivers to have a licence for their taxi was abolished (as happened in New Zealand) the value of the licence would be zero. These licences constitute a tax which has to be paid by taxi users. Emission licences for power stations or petrol refineries would operate in the same way. What is not known is how great the tax on carbon emissions would have to be to ensure that electricity users would reduce their consumption by the desired amount. In the first instance, large electricity users such as aluminium smelters, cement producers and fertilizer plants would relocate to other countries. The Australian motor car industry, already under threat from international competition, would close. And the ripple effect would spread out through the Australian economy causing unemployment first in one industry and then in another. Even more ambitious are the proposals for a global carbon permit, carbon pricing and emissions trading scheme. The basic idea is that every nation will agree on a CO2 emissions ceiling within their jurisdiction, and issue internationally tradable permits accordingly, but then allow variations on that policy by intervening in the market through buying existing permits or selling new permits. The only political regime which would make this possible is a global imperial order of unprecedented extent and authority, encompassing all of the major economies of the world, with extraordinary powers of intrusive and detailed supervision of economic and social life. At the level of contemporary national politics, the impact of such price increases and consequent economic dislocation would have political consequences. No government which introduced such a regime of carbon taxation would survive an election, but the damage that would be wrought in the meantime would be long-lasting. The global warming scam has been, arguably, the most extraordinary example of scientific fraud in the post-War period. So many people, and institutions, have been caught up in the web of deceit, master-minded by environmental activists working through NGOs and their manipulation of the IPCC processes, that the integrity of Western science is seriously at risk. The unravelling of this web will result in the loss of reputation for many individuals, but more importantly, in the restructuring of those scientific institutions in Australia and elsewhere which have tied their reputations to that of the IPCC. That issue should be high on our political agenda. I am particularly indebted to William Kininmonth and Robert Foster for their comments on this publication, and to the Lavoisier Group membership which has made its publication possible. 2. See William Gray, Address to the Marshall Institute, 11 October 2006. Available here. 3. Calgary Herald, 14 December 1998. 4. Milutin Milankovitch, a civil engineer, born in Serbia in 1879 was appointed Professor of Applied Mathematics at the University of Belgrade in 1909. See Endersbee, A Voyage of Discovery (below) for further details. 5. See I Charvatova, 1988, 'The Relations between Solar Motion and Solar Variability', Czechoslovak Academy of Science, provided by the NASA Astrophysics Data System. 6. Lance Endersbee, A Voyage of Discovery, 2005, self published, available at the Monash University Bookshop, pp. 218-219. 7. Christopher Monckton, Apocalypse Cancelled, Discussion, Calculations and References, 5 November 2006, London Sunday Telegraph. 8. Grootes, Stuver, White, Johnsen, Jouzel, 'Comparison of oxygen isotope records from the GISP2 and GRIP Greenland ice cores', Nature, 366, 1993, pp. 552-554. 9. Usoskin, Solankii, Schussler, Mursula and Alauko, 'Millenium scale sunspot number reconstruction: Evidence for an unusually active Sun since the 1940s', Physical Review Letters, 2003, 91, (21). 10. IPCC, Third Assessment Report, Figure 3.1, p 188. 11. The Wall Street Journal editorial: 'Hockey Stick Hokum', 14 July 2006. 12. Shaopeng Huang et al. (1995) compiled a major analysis of more than 6,000 ground borehole records from every continent to establish a global proxy temperature record for the past 20,000 years. The reconstruction indicated that the Mediaeval Warm Period was appreciably warmer than the current warm period, which is simply a continuation of the recovery of temperatures following the cold period of the Little Ice Age from about 1350 AD to 1850 AD. 13. 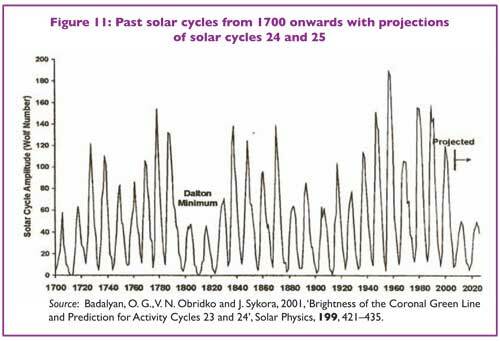 David C Archibald, 'Solar Cycles 24 & 25 and Predicted Climate Response', Energy and Environment, 2006, 17 (1). 14. See William Gray, op. cit. 15. David H Hathaway and Robert M Wilson, 'What the Sunspot Record Tells Us About Space Climate', Solar Physics, 2004, 224, pp. 5-19, NASA/ Marshall Space Flight Centre. 16. The internationally famous Soviet geneticist, Nikolai Vavilov, was arrested in 1940 and died in prison in 1943. 17. Letter to Brian O'Brien, 20 December 1990. 18. Heat: How to Stop the Planet Burning, Allen Lane, October 2006. 19. William Gray op. cit., also W. Kininmonth, Climate Change: A Natural Hazard, Multi-Science Publishing Co. Ltd, UK, 2004. The only reason the poles are not blocks of ice year round is the heat which is exported from the tropics. The idea that a bit more or less sun absorbed by unfrozen ocean at the poles will cause runaway melting is in complete contradiction to thermodynamic reality. To recap thus far, during the period of record 1880-present, Arctic temperatures generally: Rose for 60 years, to 1940; fell for 25 years, to 1965; rose for 40 years, to the present and were higher in the 30's and 40's than they are today. Polar bears are a potentially threatened (not endangered) species living in the circumpolar north. They are animals which know no boundaries. They pad across the ice from Russia to Alaska, from Canada to Greenland and onto Norway's Svalbard archipelago. No adequate census exists on which to base a worldwide population estimate, but biologists use a working figure of perhaps 22,000 to 25,000 bears with about sixty per cent of those living in Canada. In most sections of the Arctic where estimates are available, polar bear populations are thought to be stable at present. Counts have been decreasing in Baffin Bay and the Davis Strait, where about 3,600 bears are thought to live, but are increasing in the Beaufort Sea, where there are around 3,000 bears. In the 1960s and 1970s, polar bears were under such severe survival pressure that a landmark international accord was reached, despite the tensions and suspicions of the Cold War. The International Agreement on the Conservation of Polar Bears was signed in Oslo, November 15, 1973 by the five nations with polar bear populations (Canada, Denmark which governed Greenland at that time, Norway, the USA, and the former USSR). The polar bear nations agreed to prohibit random, unregulated sport hunting of polar bears and to outlaw hunting the bears from aircraft and icebreakers as had been common practice. The agreement also obliges each nation to protect polar bear denning areas and migration patterns and to conduct research relating to the conservation and management of polar bears. Finally, the nations must share their polar bear research findings with each other. Member scientists of the Polar Bear Specialist Group meet every three to four years under the auspices of the IUCN World Conservation Union to coordinate their research on polar bears throughout the Arctic. With the agreement in force, polar bear populations slowly recovered. The Oslo agreement is one of the first and most successful international conservation measures enacted in the 21st century. 22. Most glaciers have been retreating since the end of the Little Ice Age in the late nineteenth century. If the twenty-first century produces much cooler temperatures, then the glaciers will advance---again. 23. Kininmonth, op. cit., pp. 192-3. 24. For example, P. Reiter, 'From Shakespeare to Defoe: malaria in England in the Little Ice Age'. Emerg Infect Dis, 2000, 6 (1), pp. 1-11. 25. Introduction to Robert Balling Jr, The Heated Debate, PRIPP, San Francisco, 1992. 26. Warwick McKibbin, 'A climate change policy to manage uncertainty', Australian Chief Executive, 20 June 2005.